Congratulations on your raise! Now is the time to upgrade to that bigger car you’ve been dreaming about, right? Maybe not. Unfortunately, in the urban landscape, bigger is not better. Here’s why. It’s true that bigger and fancier cars look cool in TV and newspaper advertisements. The look, the shine, the power, the badge – all announce to the world that you have arrived. Or do they? Well, if you live in one of India’s bustling metropolises, you might be getting in to a lot more hassle with that big expensive car than what you already face if you currently own a smaller car. Why? Take a look at the laundry list of troubles you’ll have to deal with when you get yourselves a bigger set of wheels. Remember, the car might be built by a multinational brand, but it still has to be driven and maintained on Indian roads! So then, what’s our recommendation here? Well, as with all our articles, we promise to make this dilemma an easy one to get out of. Let’s do this. First, ask yourself this question – are you considering the bigger car primarily for use in the city or on outstation trips? If you answered ‘in the city’, make sure you check out Public Transport and App Cabs first. Is public transport from your home to work a viable option? If yes, go for it! 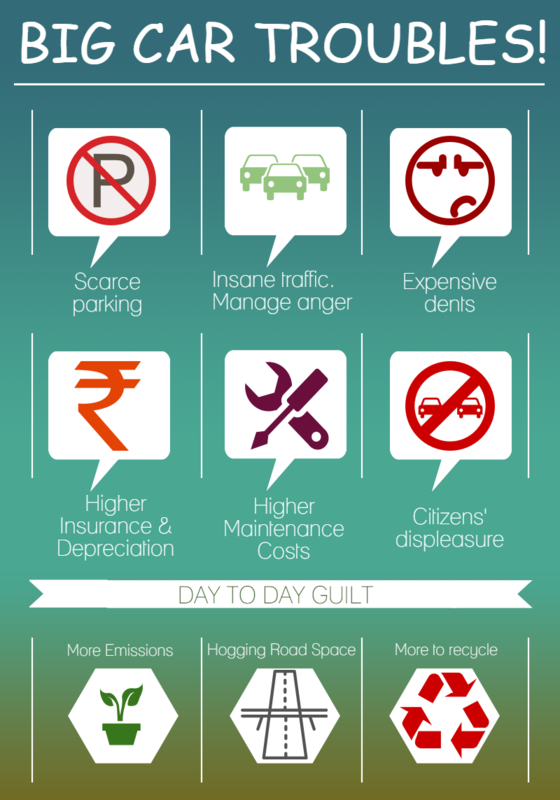 Car ownership is a bigger hassle with super congested city roads and parking spots becoming impossible to find! Cabs that you hail using an app turn out to be cheaper and hassle free too these days. The catch is that they’re often difficult to find during peak hours. Again, app cabs compare favorably to owning a big car and hiring a driver, when it comes to levels of fuss that go with each experience. Electric cars: With a 100 km range, electric cars are very practical in the city. If all you drive is 20 km a day, these cars only need to be recharged once in 3 or 4 days! They operate silently, and consume no energy when waiting at red lights. They regenerate energy when you apply brakes or go down slopes and hills. They don’t pollute the environment. They are typically small, and occupy a very small road foot print. With so much going in their favor, electric cars are truly worth considering. Feature packed small cars: Auto companies realize that bigger cars are not sustainable. So does our government. Hence the excise duty benefits on cars shorter than 4 meters. In addition to making better economic sense over their bigger cousins, sub 4m cars are also hassle free to drive and park! They’re also available in a huge price range and come packed with ‘big car’ features! Hybrids: If you truly want to tell the world you’ve arrived, why not say it with a Hybrid? Instead of going for that entry level luxury brand, get yourself a hybrid. Your hybrid will say it loud and clear that you’re not just successful, but also that you celebrate your success responsibly. What’s more, if you love tech, hybrids are great fun to drive. It’s an exhilarating experience every time you see these advanced systems work their magic. Imagine, you roll off from a red right on electric drive, and then the engine automatically kicks in after a certain speed. Exciting, isn’t it? Self drive rental: After decades of being an underserved market, the Indian self drive car industry is finally seeing some hot action. You not only can rent a car with very little hassle, you also get a wide choice of cars to choose from! Right from economy hatchbacks to luxury sedans! If all you need is a car for outstation trips, self drive car rental is going to be way more cost effective and hassle free than owning a big car just for this purpose. Second car for the weekend: Exhausted all options above and none of them worked for you? Have additional parking? 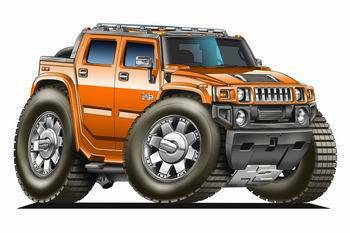 If yes, bite the bullet – bring home that big car as your weekend ride for long distance drives only. Don’t drive it in the city to avoid all the heartburn it will invariably cause you if you do. So, what do you think – should you upgrade to a bigger car? Make sure you make a scientific decision, evaluating all options and then come to a conclusion. Liked the article? Like or follow our social pages on Facebook, Twitter, or LinkedIn to get your regular feed of Wheels Wisdom articles. Petrol or Diesel? Which is a better choice? There are complex petrol vs diesel calculations out there to determine if you must choose a Petrol engine or a Diesel for your next car. 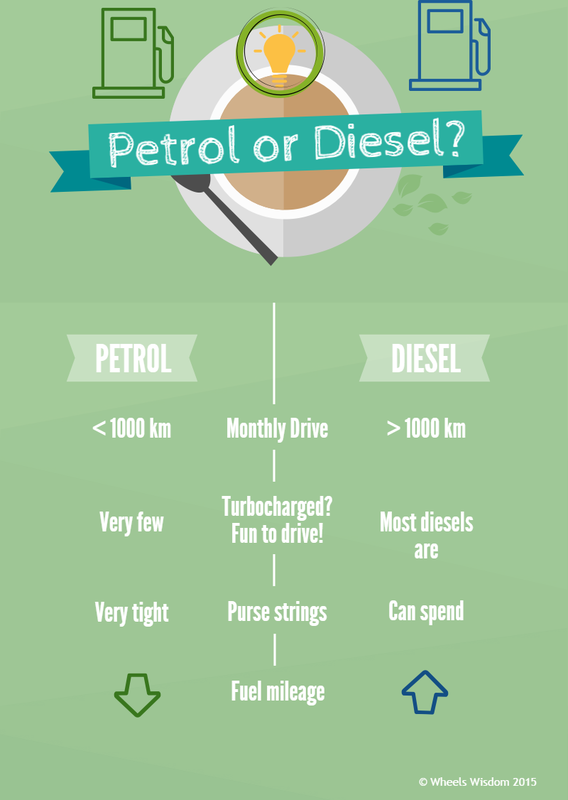 They are arithmetic in nature, and only look at the economics of owning a Petrol vs a Diesel. Just one problem – most car buyers find them far too complex, and in fact want to think beyond just economics. Then whose cause do these calculations serve anyway? Note that we kept two factors out of this mix – Cost of fuel, and Environmental impact. 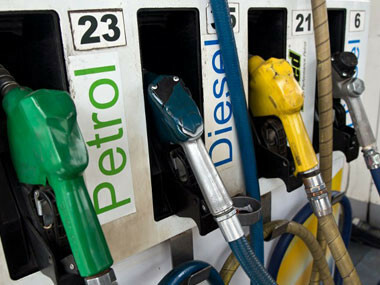 Cost of fuel – The difference in prices of Petrol and Diesel vary more than the weather, and are best kept out of the decision making criteria. The data you use to draw conclusions at the time of purchase might not stay stable for even a couple of months! Environmental impact – There is no clear winner in this department. When it comes to carbon monoxide, carbon dioxide, and hydrocarbons, Diesel engines pollute lesser. However when it comes to particulate matter, they lose out to their Petrol counterparts. Both pollute equally when it comes to nitrous oxide. With rapid advancements in both Petrol and Diesel engine technology, the equation changes in matter of months. Our view? No engine burning fossil fuels can be environment friendly. If you want to be nicer to the environment, Electric and Hybrids are the way to go! Which side do you think you belong? Wasn’t that easy? :-). Our cities face an ever increasing car population, but only have so much road to offer! The result is stop and go traffic for long periods of time, and with it, hundreds of clutch presses and gear changes. Given that this is the case with all Indian cities and towns, cars with Automatic Transmissions (AT) are becoming increasingly popular. With only an Accelerator and Brake to manage, AT’s take the hassle out of shifting gears, and make long waits in traffic a little less exhausting. Automatic Transmissions have had an interesting evolution in India. Unknown to many, AT’s have been available in India since the 1980’s, when they were made to order on Maruti 800’s for physically challenged drivers! Fast forward to the present, and customers have a huge variety of AT equipped car models to choose from. However, as car buyers check out these models, they also realize that unlike Manual Transmission (MT), AT technology varies from car to car, making the choice – well, confusing! As with all articles on Wheels Wisdom, we wrote this one too with one clear objective – simplify complexity for our readers. 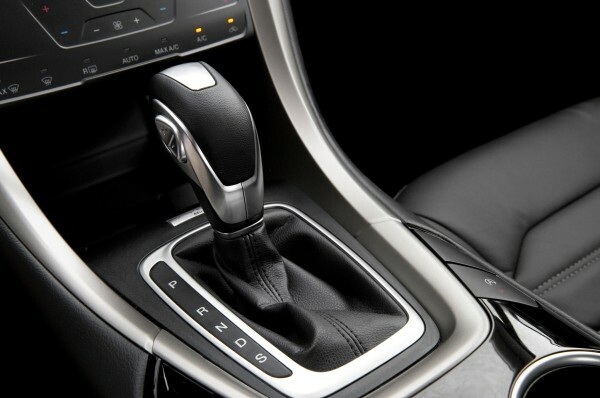 As a buyer, you must understand that the AMT and DSG are the closest to Manual Transmissions, in so far as the directness of connection between the engine and the drive is concerned. In simple terms, you can think of the coupling as being direct, with very little loss in transmission of power. CVT’s employ a belt to transmit power, but take advantage of infinite gear ratios, which result in high fuel efficiency. Infinite gear ratios are made possible by the use of a drum like component that has a varying diameter, as you look at it from side to side. Conventional Automatics don’t have a direct coupling between the engine and the drive at all – neither direct, nor driven by a belt. Instead, they have a fluid clutch. Again, in simple terms this means some engine power is lost in transmission, resulting in lower fuel efficiency. Conventional Automatics are more reliable in the log run. They have been proven workhorses for decades, and are cheaper to make. The dampener in the case of conventional AT’s though, is the Fuel Economy. DSG’s on the other hand are technologically advanced automatics and are fun to drive, but still don’t offer bullet proof reliability. They are also more expensive to manufacture. CVT’s and AMT’s are not very exciting to drive, but are highly efficient and reasonably reliable as well. That’s it! We’ve kept unnecessary detail and clutter out, so that you’re clear about what various Automatic Transmission technologies bring to you – the end customer.